1. Create tutorial videos. These kinds of videos are good because they're easy to make and they provide information that people need. For example, if you're promoting a course on how to drive traffic, then talk about traffic driving methods. Impart real info, not a sales pitch. And at the end of the video, remind them to click the link below for more information. 2. Don't narrow your target market too much. For example, if you're teaching people how to drive traffic, don't make it, “How to drive traffic to an origami website.” Yes, you'll get views from people with origami sites, but no one else. 3. Don't sweat the subscribers too much. It's great to have some loyal subscribers because every time you post a video some of them will almost immediately watch and comment on the video. This gets you boosted higher in the rankings and thus more easy to find by new people who have never heard of you. They'll leave comments, pushing you still higher in the rankings and making it even easier for people to find you. It's your subscribers that start the ball rolling, but it's commenters (subscribers and non3 subscribers alike) who push you higher and higher in the rankings and thus get you more viewers. So while you eventually want tons of subscribers, know that even a few at the beginning will get the ball rolling. 4. Use your best keyword(s) in your video's title. Think about what a person would search for if they needed the information found in the product you're promoting. For example, back to our traffic product, they would probably type in something like, “How to get more traffic to my website.” Do some research on this and find the best keyword phrase(s) to use so that you can get found. 5. Place all of your best keywords in your tag section. Your very best keyword(s) go in your title, but you don't want to over load it. Instead, place all of your other good and great keywords (including the ones in your title) into the tags section. How do you find your best keywords? One way is to find the most viewed videos in your specific niche and then use the keywords that repeatedly show up in these top videos. 6. Collaborate. When you make a video with someone, you get your viewers and THEIR viewers watching the video. 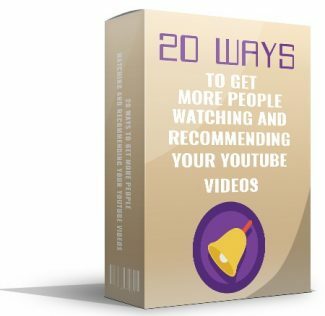 Collaborate with 10 different people on 10 different videos, and now you've got 10 new audiences viewing your videos and possibly buying your product. This works especially well if you are promoting your own product, since you can then give a commission to the person you're collaborating with and build your list of buyers. Plus this is a great way to build relationships with other marketers who might refer people to your videos in the future even when you're not collaborating with them. 8. Encourage video responses. A video response is like a comment on steroids – it's a video someone makes in direct response to your video. Their subscribers then watch your video to understand what the video response is all about This gives you an entirely new audience watching your video and perhaps clicking your link or viewing more of your videos or even subscribing. 9. BE a video response. After you make your YouTube video, search for other videos that are somehow similar. In other words, what would you search for to find your video? And when you make that search, what other videos come up? Now go to the first video, and if it's appropriate in content and has a lot of viewer activity, submit your video as a video response to that video. 10.Don't hate on the haters. You're going to get hate comments because, well, you just will. There are folks out there who are looking for things to hate, and sooner or later it will be you. Three things you should know: First, a hate comment is actually a compliment. Something you said or did had an impact on them, or they would have simply clicked away with no comment at all. So take it as a good thing. Second, do not respond. At all. Simply ignore the hate comments and go on with making your videos. If you get bogged down by the haters and the trolls, then you won't be in the right frame of mind to continue making great videos. Third, once you put anything online, it's in cyberspace forever. Your negative responses to negative comments can come back to bite you time and time again, so just don't do it.